And wow. What a fantastic start. 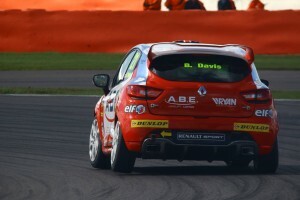 After just one impressive performance in the older generation Michelin Clio Cup Series back in April 2015 at Rockingham, Davis (from Herefordshire), takes it to the next level and competes in the Renault UK Clio Cup’s 15th and 16th round at the famous Silverstone circuit. 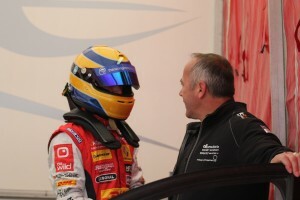 This is a fantastic step up for the young driver to compete in the primary support series to the prestigious British Touring Car Championship (BTCC). The news was released shortly before the race weekend that this sparky rookie driver would be entering into the big leagues of the UK Clio Cup. Questions had to be asked; how would this young driver do? How would he cope with the different car with no real testing? With higher stakes to play for, would the pressure be too much? It has to be remembered that he was going into this weekend with only two race weekends in cars. Well if you watched the race at home on the edge of your seats or if you were one of the 65,000 people cheering in the grandstands then you know the answer…But for those of you didn’t, let’s just say he did really rather well. 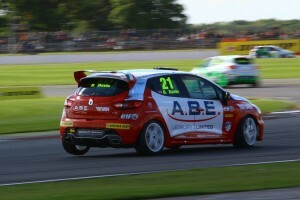 Read more below for the full report on Ben Davis in the UK Clio Cup at Silverstone. This historic track is a true legend in the hearts’ of British motorsport fans, host to the prestigious Formula 1, the crazy MotoGP and of course, the exciting and unpredictable BTCC with its fantastic support series, including the UK Clio Cup, Porsche Carrera Cup, Ginetta GT4 Supercup, Ginetta Juniors, and the MSA Formula class. This wide-tarmacked track is famous for its slipstreaming, with plenty of long straights to gain momentum. Drivers race bumper-to-bumper until the moment is right to take the sling-shot move and overtake their competitors. The conditions for qualifying were near perfect, with clear skies, but a slight change of wind direction was sure to keep the young driver on his toes. Having made changes to the setup of the car after Friday testing, Davis performed well in qualifying and achieved P11 and P10 for the grids for Sunday’s races. Just over 1 second covered the entire field of cars so Davis certainly kept up with the more experienced, championship-winning drivers of the UK Clio Cup. This was it, time for Davis to have the opportunity he had been waiting for, after months of waiting, planning and constantly working to gain the budget required, the opportunity to prove his potential as a racing driver in the high-profile UK Clio Cup had finally arrived. A grid of 20 cars in total lined up for the 15th and 16th rounds of the thrilling 2015 championship. The lights go out! Davis flew off the line with an excellent start (despite never doing a race start in the car before) and avoided the usual Clio shenanigans at turn 1, swiftly making a place into P9. This rookie driver gained further positions from contact ahead and then started hunting down the battle for P5, showing the fans that he can handle the pressure despite the higher stakes and unfamiliar setup. The exhilarating Brooklands/Luffield section never disappoints and with some bumper-to-bumper, three car-wide action Davis made sure to hold his own amongst the more experienced Clio Cup drivers. The three drivers, Davis, Price, and Witts provided grandstand cheering scenes for the spectators at Silvestone and nail-biting moments for the pit crews and families watching on. They swapped positions lap after lap and the young driver finishes a very impressive P6 and proves to everyone and himself that he has quickly adapted to these newer and more challenging race cars. His pace was clear to see setting a lap time just 1 tenth off the fastest lap of the race. Even more impressively, he set the fastest sector 2 time of anyone. Davis had a fantastic start to race 2 as he skilfully manoeuvred his way into 5th place and began to gain on the top four drivers; the experienced four title protagonists. Working hard to distance himself from the drivers behind and keeping composed under the pressure, Davis was doing extremely well. With each lap the scenes at Luffield became more intense, until there was some contact at the apex of the corner on lap 4 which resulted in an uncomfortable entry into the right-hander of Luffield for all involved. Davis caught the slide he was sent into and got back onto the track but some more contact from behind led to the loss of two positions. Despite now being in 7th position, Davis quickly regained his composure and headed into Woodcote and the start-finish straight, hot on the tail of the two drivers in front. Unfortunately, the contact caused some damage to the car and Davis started to slip back as he battled with the steering. It was an unlucky incident and through no fault of his own, meant the young driver could no longer race to his full potential. Davis worked the car to its limit, adjusting to the handling and was catching the group ahead when the checkered flag came out, ending the race 7th out of 20 drivers. 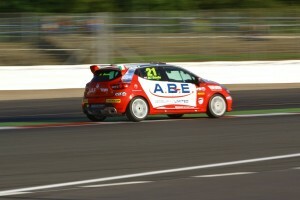 A truly great performance for Davis in his first ever UK Clio Cup race weekend and third ever car racing experience. His sponsors, fans, friends and family were all overjoyed at his results; exceeding all their expectations and bringing his sponsors some great coverage as they cheered him on from their hospitality suite. Davis continues to chase the dream. Ben Davis is a driver who is yet to showcase / reach his true talent and is looking for sponsors to venture in to 2016 in the Renault UK Clio Cup. Please contact him to discuss potential corporate opportunities. He has already had a brilliant response from his performance at Silverstone; add your name to the list of his partners.